Mid-Autumn Festival has always been one of my favourite holidays and this year it falls on September 24. Growing up, my mid-autumn festivals have always been filled with paper lanterns and mooncakes. I would always have family dinner on the night of mid-autumn and walk over to friends' houses to play with paper lanterns and to enjoy mooncakes. When I was younger, I would eat mooncakes just for the salted egg yolk centre. I did not develop an appreciation for the rich and intense lotus seed filling until I got a bit older. A mooncake is not what we normally associate with the word cake. It is a puck-sized dessert of an intensely rich and earthy lotus seed paste baked inside a thin soft crust. A salted duck egg yolk in the centre of the mooncake to represent the full moon on mid-autumn. The salted egg yolk is slightly sweetened by the lotus seed filling and is the perfect combination of sweet and savoury. My family have always bought mooncakes from the store and I have never thought of making my own until I saw Two Red Bowl's post a few years back. I ordered some mooncakes molds off of Amazon and here I am sharing this recipe and mooncake tutorial with you today. Making mooncakes is a labour intensive process. Labour intensive, but also very enjoyable. 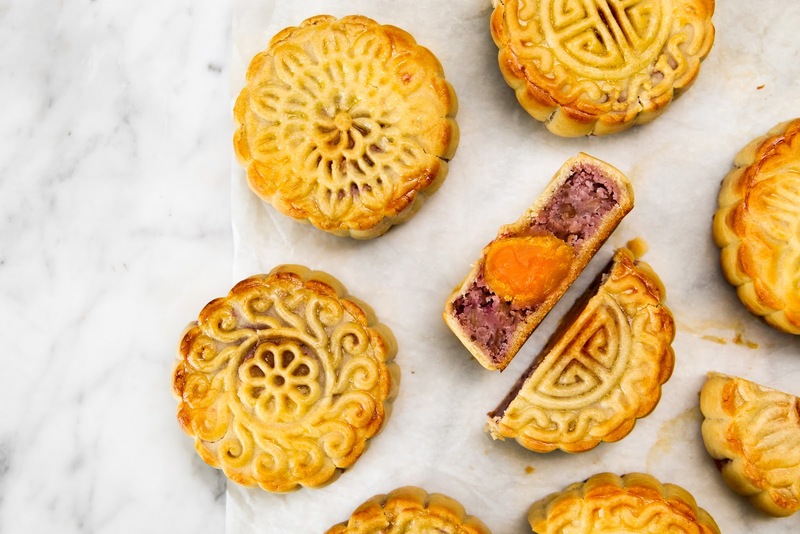 The first task is to visit an Asian grocery store to pick up the essentials for mooncakes — salted duck egg yolks, lotus seed paste (for traditional mooncakes), and alkaline water. Alkaline water or kansui is a solution that regulates acidity in the process of dough making. 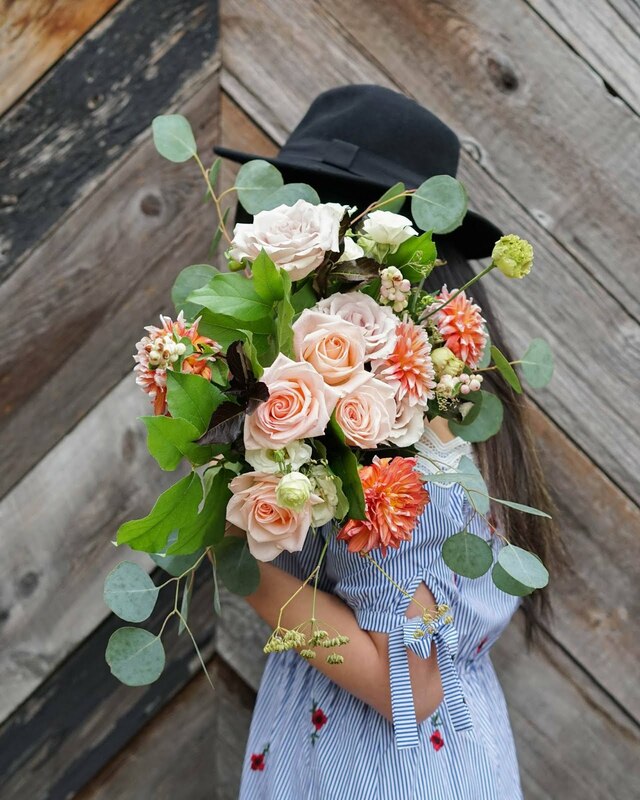 Alkaline water may sound foreign but you probably have encountered it before — it is what make many types of Chinese egg noodles and Japanese ramen have a springy mouthfeel and take on it's distinct bright yellow colour. Only a small quantity is needed for mooncake making so I made my own alkaline solution. 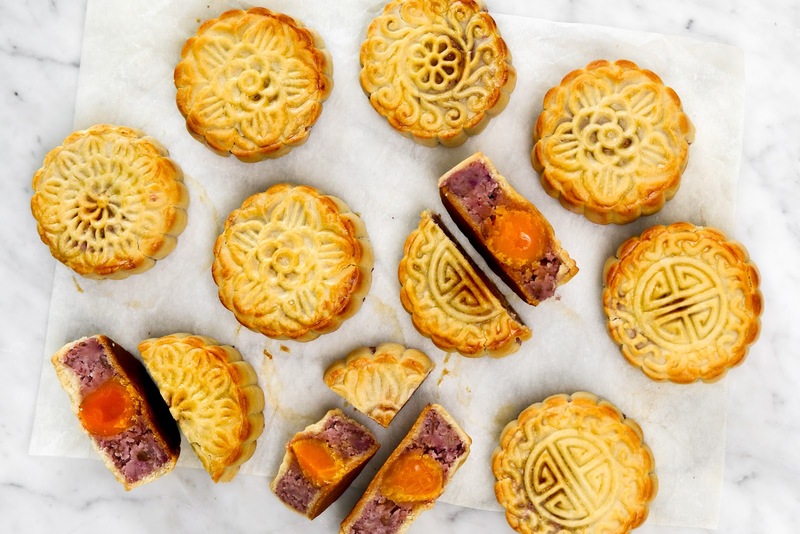 Traditionally mooncakes have a lotus seed paste filling. The lotus seed paste is sweet, rich, and earthy. 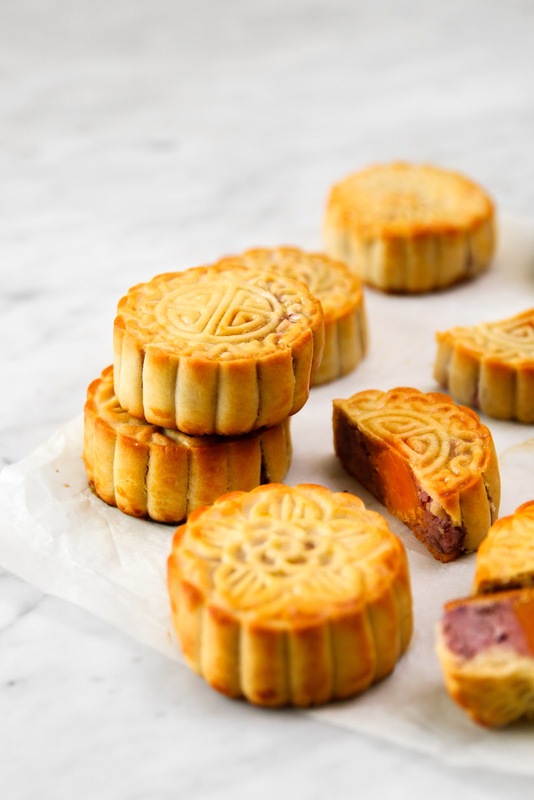 Larger mooncakes will usually have a whole salted duck egg yolk, which represents the moon on mid-autumn. 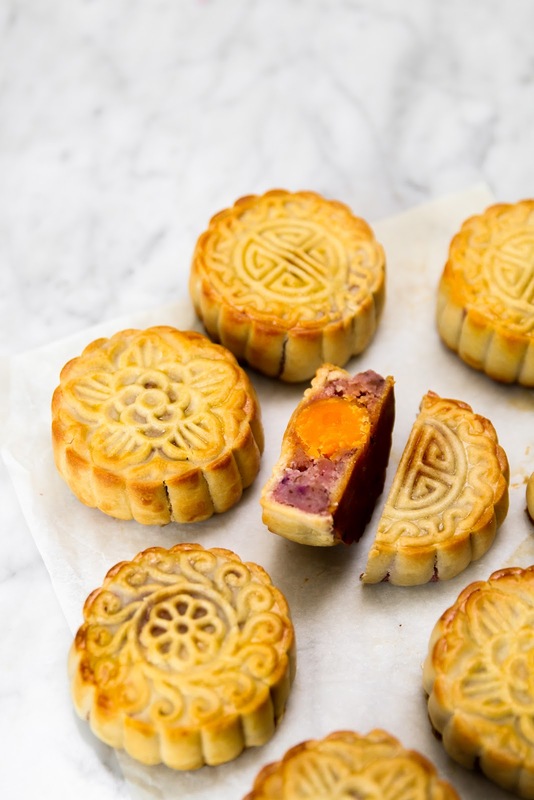 For me, the salted duck egg yolk is the best part of the mooncake, especially when it has been lightly sweetened by the lotus seed paste that surrounds it. 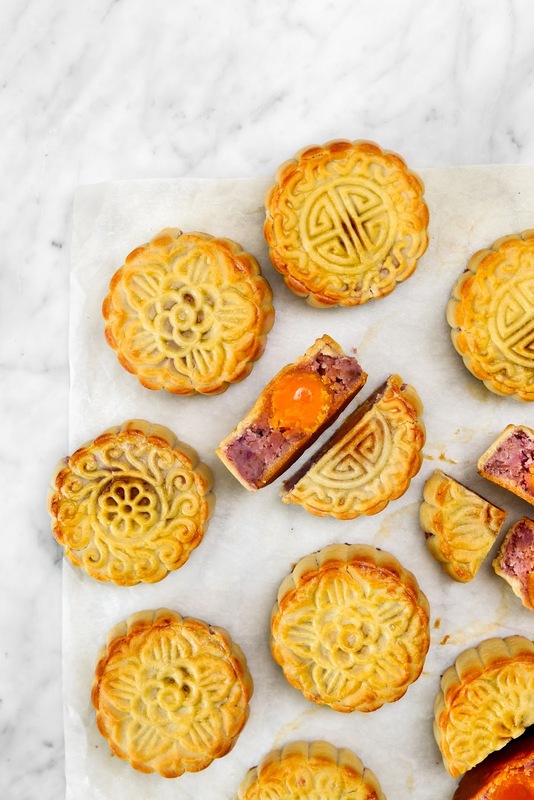 Throughout the years, the filling of mooncakes have changed. 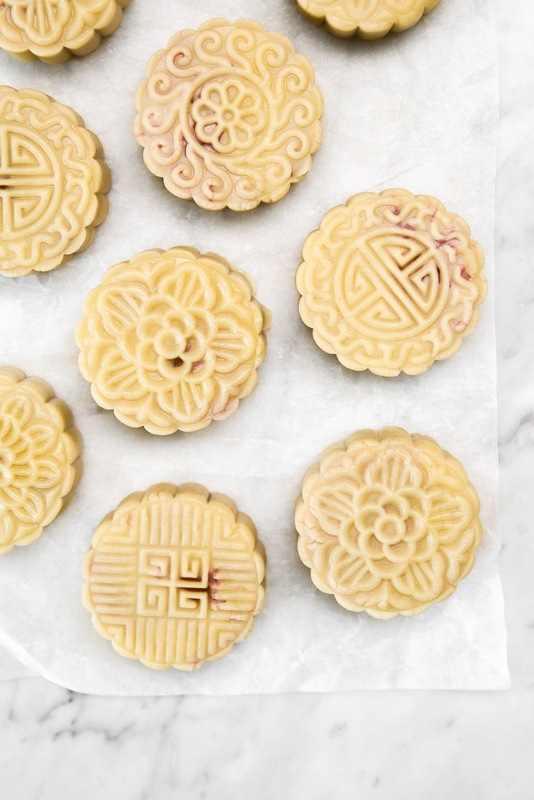 Of course the traditional lotus seed filling is still a popular choice, but you can also find fruit and tea flavoured mooncakes at the store. Another popular variation is the 'snow skin mooncake,' which is a non-baked mooncake wrapped in a glutinous rice wrapper, much like mochi. For my mooncakes I opted for the more traditional baked variety — I love the sheen and the golden colour of the traditional mooncake. 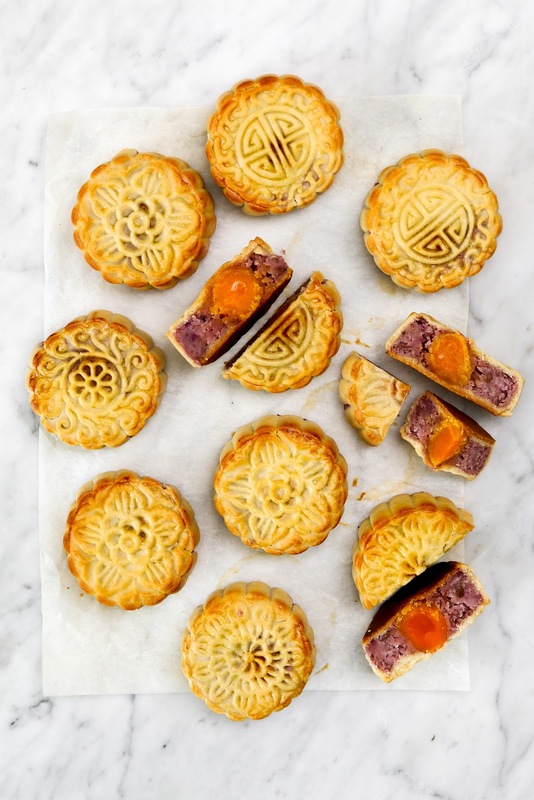 Instead of a lotus seed filling, these homemade mooncakes are filling with a taro filling and of course, the salted duck egg yolk. Taro fillings are more common with snow skin mooncakes but they are just as good in the traditional baked crust. I added a purple yam to the taro mix to increase the intensity of the purple colour of the filling. If you are making your own mooncakes and want to have a salted duck egg yolk in yours as well, you want to use cooked salted duck egg yolks in your mooncake. Sometimes a raw and cooked salted egg yolk are hard to distinguish because the curing process has solidified the raw yolk and it is no longer runny like a normal raw egg yolk. The easiest way is to buy a pack of cooked salted duck egg yolks. If you can only find raw ones, simply place the yolks on a baking sheet and bake them at 250F for roughly 7 minutes to cook them. I tried buying cooked whole salted eggs and removing the egg whites myself (this option is much cheaper!) but usually these yolks are not as vibrant and rich as the ones that come in the yolk-only packages. You can still use these yolks but they will not resemble the traditional mooncake yolks as much. The mooncakes will be just as tasty though. Lastly, bake mooncakes a day before you want to serve them. When you take mooncakes out of the oven, you will notice that the crust is slightly dull and will not have the glossy sheen you see with store-bought mooncakes. This sheen starts appearing several hours after it comes out of the oven. This process is called '回油' ('return of oil'). They taste the same, sheen or not, but the sheen makes them extra pretty. Wash and peel taro root with potato peeler. Wearing gloves for this step is helpful because raw taro can leave skin feely waxy and itchy. Cube taro into 1 inch cubes. Repeat steps for purple yam. Place taro and purple yam cubes into a steamer or steaming basket. Steam until tender to the fork, roughly 30 - 40 minutes. Remove taro and yam from steamer. Using a fork or potato ricer, mash the root vegetables into a smooth paste. Add salt, sugar, vegetable oil into mixture. Mix until well combined and paste is smooth. Set aside and let the filling cool. Whisk together the golden syrup, oil, and alkaline water. Then add the mixture to the flour, and use a rubber spatula to fold and combine everything into a soft dough. Do not overwork the dough. Cover the dough and let it rest in the refrigerator for an hour. Weigh out twelve 60-gram scoops of taro filling and gently shape each portion into balls. Set aside. Divide and weigh the dough into twelve 25-gram pieces. Keep any leftover dough to use for mending when dough cracks during shaping process. Take on of the taro balls and make a deep well in the middle. Insert one salted duck egg yolk into the well. Close the top and reshape into a ball, trying to make sure the egg yolk is as centred as possible. Repeat for the remaining 11 portions of filling. Lightly dust dough balls with flour. Roll out dough ball on a piece of parchment paper into 4-inch round. Put one piece of the filling in the centre of the rolled out dough. Carefully use the parchment paper to fold the dough onto the filling so that it wraps around the filling. It is okay if your dough cracks - we can reshape it and patch any holes with the reserved dough. Turn the opening side up and slowly press together to close the opening, to cover all surfaces of the filling. Keep the distribution of dough as even as possible. Brush on a bit of flour into mooncake mold. Place assembled dough ball into the mould. With the mold facing upwards, apply gentle pressure to shape the dough ball into the mold cavity. Flip the mold over and press the mooncake down with the top pressure bar. Gently guide the mooncake out of the mold. Place moon cakes onto a parchment-lined baking sheet. Using a spray bottle, gently mist the moon cakes with water. Alternatively you can very gently use a pastry brush to brush on a very thin layer of water onto the top of the moon cakes. This will prevent the moon cakes from cracking when baking. Immediately put the mooncakes in the oven and bake for 5 minutes. While the mooncakes are baking, prepare the egg wash.
Once five minutes are up, take mooncakes out of the oven. 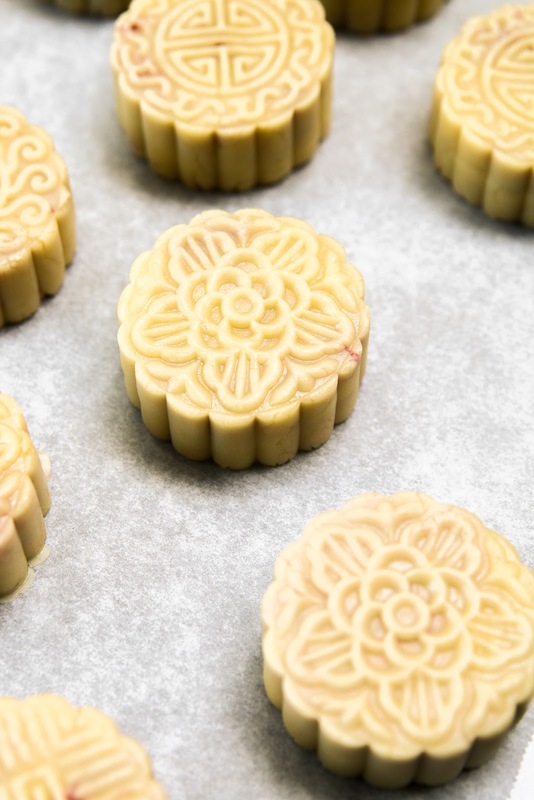 Brush a thin layer of egg wash onto the mooncakes, making sure there are no large puddles of egg wash. Large wells of egg wash will make your moon cake design less defined. Bake for an additional 15 minutes until golden brown. Remove mooncakes from oven. The mooncakes will look dry at this point (vs. the glossy sheen of moon cakes from the store). 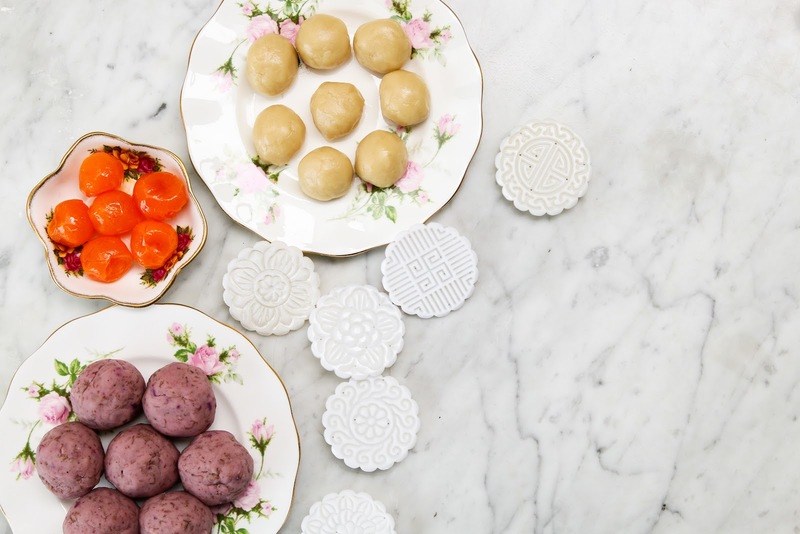 Store the cooled mooncakes in an airtight container for a day and the skin will develop the glossy finish we associate with traditional mooncakes. You will start to see this sheen develop within the first couple of hours.